Microsoft has just launched the fifth generation Surface Pro 2-in-1 in India. It comes with a starting price of Rs. 64999. It will be available from Amazon and Flipkart online stores along with Reliance, Vijay Sales, and other authorized offline retail stores starting February 22. The Surface Pro features a 12.3-inch PixelSense Display with a screen resolution of 2736 x 1824 pixels. It comes with 165-degree adjustable to give you comfortable experience. It is powered by latest 7th Intel Kaby Lake processor and comes in Core m3, Core i5 and Core i7 variants. The Core m3 and Core i5 come with a fanless design. The core m3 model comes with 4GB RAM, 128GB of flash storage and packs Intel HD Graphics 615 GPU. The Core i5 model will be available in 4GB RAM and 128GB storage and 8GB RAM with 256GB storage. Both variants packs Intel HD Graphics 620. The Core i7 model comes in three variants including Core i7 variant comes in three variant including 8GB RAM and 128 GB storage option, 16GB RAM and 512 storage, and 16GB RAM along with 1TB storage. These three variants packs Intel Iris Plus Graphics 640. It has 8-megapixel rear camera and 5-megapixel front camera. Both cameras can record 1080p videos It has USB 3.0 connector, one Mini DisplayPort, micro SDXC card reader, Surface Connect for charging and headphone jack. It also has dual microphones and new 1.6W stereo speakers with Dolby Audio Premium. The company also claims up to 13.5 hours of battery life. The Surface Pro Type cover is also available for Rs. 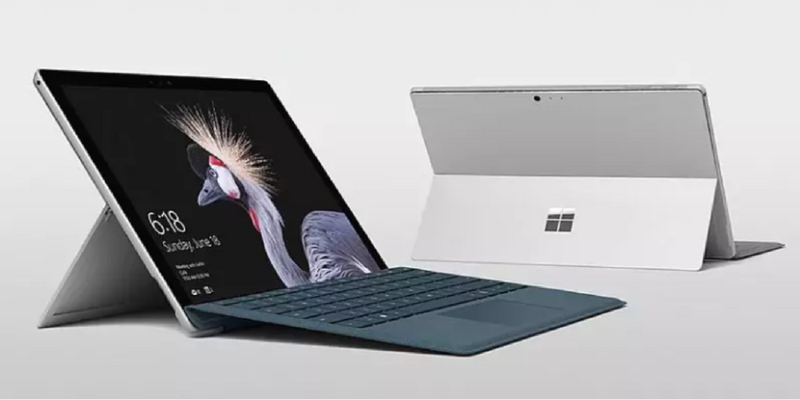 10999 and Surface Pro signature type cover for Rs 12,999. The Surface Pen costs Rs 7,999 and Surface Arc mouse costs Rs 6,399. Tags:Display, Microsoft, new Surface Pro, Surface Pen, SURFACE PRO .